Cosy & friendly bar in the heart of Mexborough. 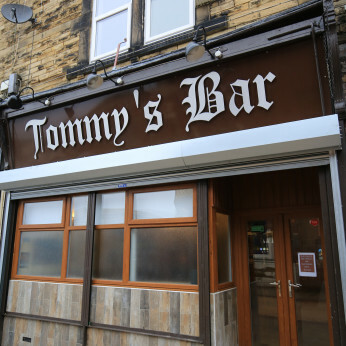 Tommy's Bar is a family run business which has been trading for almost 4 years. We opened the bar in memory of our Grandad 'Tommy' and since have aimed to keep family members a strong part of the business. We found a premises on the High street which could be modernised yet its features maintained. We currently hold around 30 people which adds to the homely feel of the bar and we, as a family, feel very strongly about making sure all our customers are made to feel comfortable. Over the last 4 years we have built up a very good group of customers who always make any new customers feel very welcome. All our staff are very approachable and customer service is very important to us. We have a food hygiene rating of 5 and we keep up with the maintenance of the building very well. We have a fully up to date Jukebox and a darts room with a tv, as well as a 'Cash Ahoy' bandit which holds a £100 jackpot. There is a very inviting beer garden to the rear with stone tables/benches, outside speakers and toilets which is a suntrap during the summer! Throughout the summer months we hold regular outdoor gatherings and the atmosphere is always great. Watch it at Tommys! 7pm. Free food offered at half time! Please be advised we open everyday at 10am until late. Closing times may vary. Weekends are usually between 21:00 - 22:30.